What's special about Waitrose pork? - Our outdoor bred pigs live their lives in straw based accommodation and have a lot more space to thrive than the industry average. - This is the minimum standard for our pigs, and none of our pig farms use slatted floors or confinement stalls. - All of our Waitrose fresh pork, bacon and sausage is 100% British, and all the pork in our essential Waitrose sausages comes from British outdoor bred pigs. - You'll not find any rind, offal or mechanically recovered meat in any of our sausages and we never add water to our ham. Our pig farmers are located predominantly in East Anglia, where the light, free-draining soil and low rainfall provide ideal conditions for pig farming. The result is tender, fine-grained meat, with just the right amount of fat and plenty of flavour. Waitrose is unique in producing all of its pork, sausage, bacon, gammon, BBQ, slow cook, easy-to-cook and cooked meat ranges from pigs from our dedicated farms, which means we can guarantee the same high quality and traceability in our pork pies as we do in our pork chops. It also enables us to use as much of the meat as possible, helping us to guarantee a satisfactory return to our farmers. This allows them to invest in sustainable farming methods to supply our pork in the future and encourage wildlife development on their land. Waitrose has won a Good Pig Award at the Compassion in World Farming (CIWF) Good Farm Animal Welfare Awards, recognising our commitment to British outdoor bred high-welfare pork across its entire own-brand range of products, including its everyday essential Waitrose range. essential Waitrose pork comes from British outdoor-bred pigs. All Waitrose sows live outdoors, free to roam in large paddocks with access to straw-bedded arcs or tents. Every Waitrose pig has free access to fresh straw, allowing them the freedom to create a comfy, warm bed. Pigs are born outside and live with the sow outdoors until they’re weaned at around four weeks old. They’re then moved to bright, airy, straw-bedded barns and are fed a cereal-based diet created by our dedicated livestock nutritionist. Our organic pork comes from four farms in Yorkshire and Norfolk, where the pigs are fed an organic diet and allowed to roam freely on land farmed to organic standards. The farms are independently monitored by the relevant organic accreditation bodies. We sell three different breeds of free-range pork products - Hampshire sired, Berkshire sired and Gloucestershire Old Spot sired. 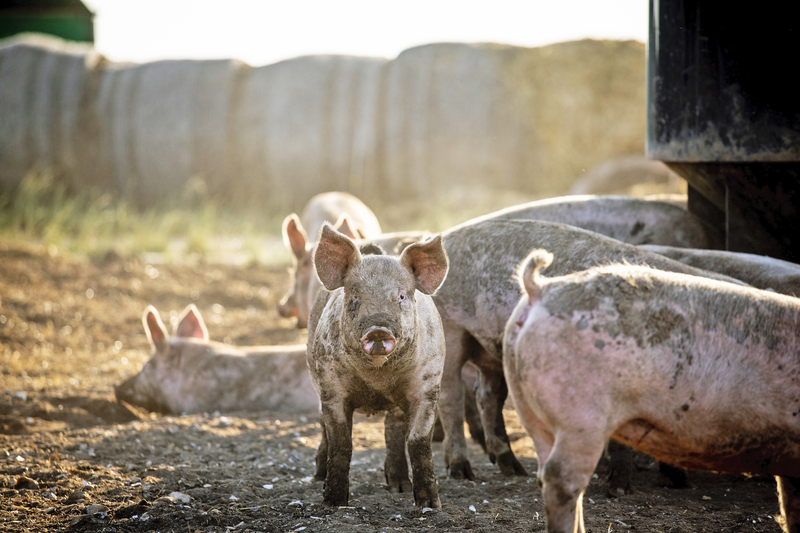 All Waitrose free-range farms rear pigs exclusively for Waitrose and work within producer groups to ensure that they meet standards of animal welfare and animal husbandry. Our free-range pigs spend their entire lives outdoors, with straw filled arcs and tents for shelter. All of the pork on all of our Service Meat Counters is Free Range. Waitrose Hampshire-sired free-range pork is reared on a limited number of specialist farms based in Norfolk, Suffolk and Wiltshire and is produced from pigs sired by Pedigree Hampshire boars. Hampshire pork is renowned for its succulence tenderness and superb flavour. Waitrose Hampshire-sired free-range pork is found in selected Waitrose branches in both pre-pack assortments and on the service meat counter. Gloucestershire Old Spot-sired free range pork is reared exclusively for Waitrose on just one farm in Wiltshire. The meat comes from pigs sired by Pedigree Gloucester Old Spot boars. The pork is highly marbled with fat, which means it’s juicy, tasty and wonderfully succulent. Gloucestershire Old Spot-sired free range pork can be found in our pre-pack bacon and sausages on the service meat counter in selected branches. Waitrose Berkshire-sired free-range pork is reared on a dedicated farm in Suffolk. The pork comes from pigs sired by Berkshire boars and is outstandingly tender and succulent and packed with flavour. Waitrose Berkshire-sired free-range pork is found in selected Waitrose branches on the service meat counter.